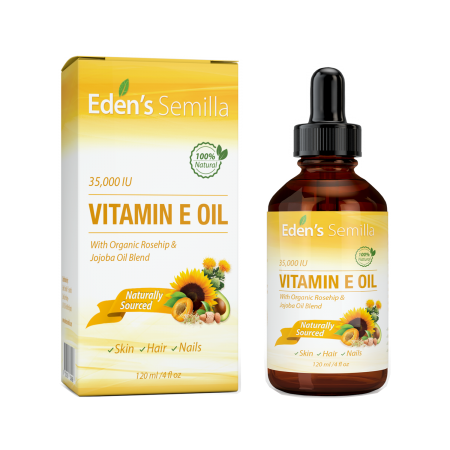 Recently I had the opportunity to try out two of Eden's Semilla's natural oils for skincare. I tried out their Vitamin E oil and their Jojoba Oil. Both came in 4 fl.oz./120mL sizes. I used them on my skin for a few weeks. Here is a review of both of the oils. Eden's Semilla is 100% natural. It comes from Vitamin E (d-Alpha-tocopherol) oil that is 100% extracted from plants naturally rich in Vitamin E. Natural Vitamin E has been proven to absorb more quickly and efficiently by the body than other synthetic types. The viscosity of pure Vitamin E Oil is thick and sticky. A blend of Eden’s Semilla Rosehip & Jojoba Oil gives the oil the perfect consistency for easy application. Fast acting, absorbent and non greasy. 35,000 IU means the blend contains no less than 25% Natural Vitamin E. Vitamin E Oil contains natural antioxidant protection that helps to combat the signs of aging. It helps repair damaged skin, provides hydration for dry skin and provides relief for skin irritation and sunburn, a great solution to tangle free silky smooth hair. Eden's Semilla has a 100% Money Back Guarantee if you are not satisfied with the product. No questions asked. Currently you can purchase more than 1 bottle of any of their products and receive 10-15% off the following products: Rosehip Oil, Jojoba Oil, Vitamin E Oil, Vitamin C Serum and Hyaluronic Acid. The Vitamin E Oil is a very nice oil. It helps dry skin, making it feel hydrated and it helps skin that feels burned (I tried it on skin that I has just peeled and it soothed it) and it is great to use on hair prior to shampooing (mix through hair then shampoo out after about 10 minutes of conditioning). 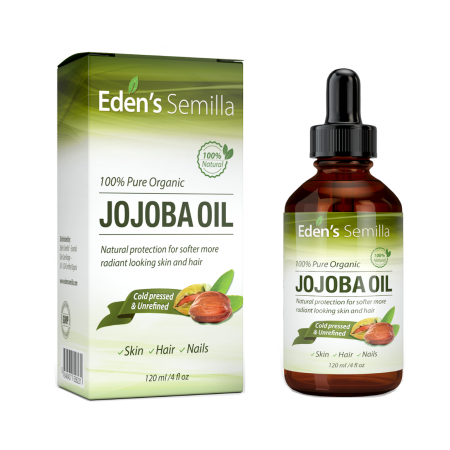 The Jojoba Oil from Eden's Semilla is cold pressed & unrefined and is naturally rich in vitamins and minerals making it the ideal choice for a multipurpose oil moisturizer. It is all round protection that benefits your body literally from head to toe. Jojoba Oil has natural skin healing properties that helps to guard against skin irritation, inflammation, acne, dryness and chapped skin. This oil is fast absorbing and non-greasy making it easy to apply and suitable for all skin types. It has antioxidant and Vitamin E protection that can repair damaged skin cells and make skin firmer and more elasticated, so that it promotes the skin's natural production of collagen, helping to reduce fine lines, wrinkles and even scarring. The excellent moisturizing qualities of Jojoba Oil provide ultimate hair conditioning that leaves hair feeling rejuvenated and full of life. Natural antibacterial protection for the scalp that keeps hair looking healthy and clean. Guards against split ends, thinning hair and promotes natural hair growth. Also great for chapped lips and brittle nails. It is 100% natural, pure and organic. To make Jojoba Oil the development of jojoba oil is to go through a cold-pressed manufacturing process meaning that all those wonderful natural ingredients are retained. 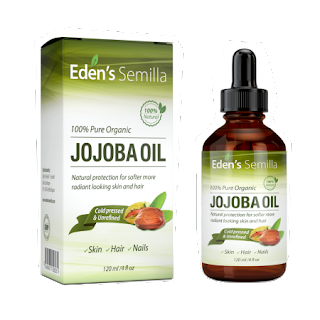 I have been using Jojoba Oil for years. I love the Eden's Semilla formula more than any other I've used. I think it is the process they go through to get the jojoba oil and the quality of the oil is superior to any that I currently have or have used. My skin became velvety soft while using this. I had soft skin but it became even more butter soft because i used the Eden's Semilla Jojoba Oil. So velvety. And I used it on my nails because my nails are a mess. I'm not sure if it helped them grow, as I am also taking biotin to help my hair and nails grow. but it did help my hair, especially around the ends. It really helped with the dryness at the ends and soothed it, making it disappear. Eden's Semilla products are found on www.amazon.com. Like Eden's Semilla on Facebook: https://www.facebook.com/Edens-Semilla-1757036427889958/; Follow Eden's Semilla on Twitter:@edens_semilla and Follow Eden's Semilla on Instagram:https://www.instagram.com/edenssemilla/.